Ancient Greek hairstyles changed as ancient greece changed, reflecting the preoccupations and aspirations of its residents. Hairstyles signified something about the wearer's age, taste and city of origin, but not much about his or her social class (except for slaves, whose hair was usually short). In their private lives, Athenians were severe and simple, with no great difference between how the highest and the lowest citizens dressed, lived or ate. In Sparta, men and women often went about naked, or with their chitons (draping white garments) opened at the sides. This scandalized the more reserved Athenians, but the Spartans saw no problem with it. Indifference to luxury does not imply absence of vanity. Blond hair was considered attractive, and both men and women bleached their hair with potash water, as well as drying it in the sun to reach a lighter color. Makeup was though frowned upon as pretentious; this did not stop some women from using it. Many women rubbed white lead into their faces, and perhaps red pigment for blush and charcoal as eyeshadow. The heterae, ancient Greek equivalents to geishas or courtesans, sometimes wore makeup to increase their appeal. This androgyny led to some uniformity in hairstyle. Men and women wore their hair in long curls; it's unclear whether their hair was naturally curly, or if they curled it with tongs or similar implements. 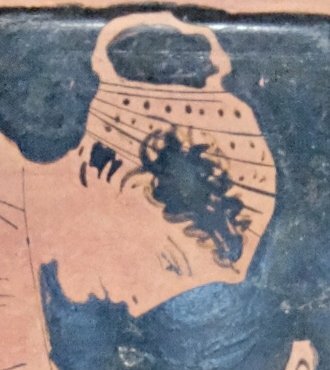 In a famous passage from Homer, Athena makes Odysseus's hair flow down from his head in "hyacinthine curls." We might therefore deduce that these curls were natural, at least for some portion of the population. 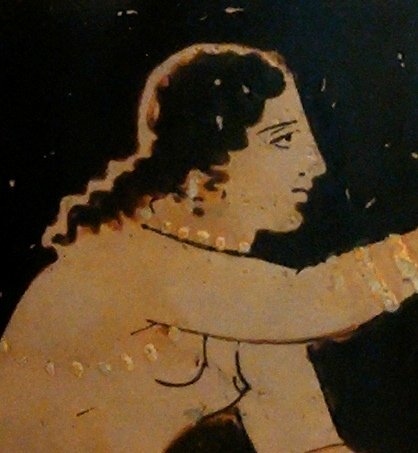 Women's position in ancient Greece was shockingly low. Married women were isolated in their homes, forbidden to socialize with other women, let alone other men. This might explain the relative indifference to luxury in ancient Greek society. Women wore their hair long and in curls, sometimes plaited, sometimes with tresses draped over the shoulders. After the defeat of Persia in 449 BC, oriental styles grew less popular, and women began pinning their hair in a knot or bun at the nape of the neck, sometimes with a band or a net wound around the head. Scarves and diadems were also available. During mourning, women cut their hair short. Men grew their hair long. A boy cut his hair short (about chin or jaw-length) when he reached adolescence, and remained with a short haircut until he became older and more distinguished. The beard was a mark of distinction and virility. It was only when Alexander the Great ordered his soldiers to cut off their beards, and thus give the enemy one less thing to grab, that the beard lost some of its grandeur; still, it was the mark of a philosopher or a sage. 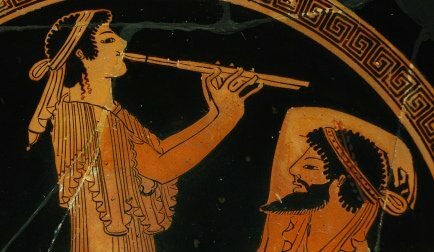 There were several popular ancient greek hairstyles, worn by men as well as women: the krobylon was an updo with hair gathered, tied and pinned over the forehead; the Kepos, a bowl-cut used for youths and slaves; the Theseid was a sort of proto-mullet which was short in front and long in the back; the Hectorean was combed back into curls. Garlands and diadems were worn by eminent Greek leaders, including Alexander the Great and prominent statesmen. This was also worn by prominent people at their funerals. A Brief History of Lipstick. 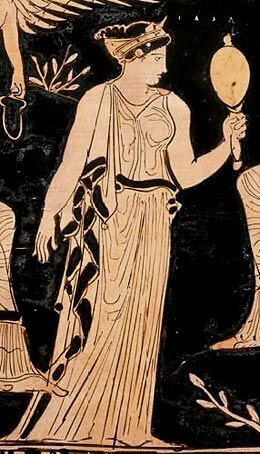 Ancient Greek Hairstyles and Costumes. Return to our Vintage Styles section.